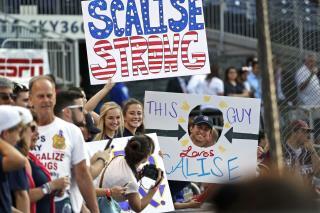 (Newser) – Lawmakers from both parties were praying for Rep. Steve Scalise on Wednesday night after the congressman's condition worsened and he was readmitted to the intensive care unit at a hospital in Washington, DC. The MedStar Washington Center Hospital says the Republican, who was shot during practice for a congressional baseball game three weeks ago, was readmitted to the ICU "due to new concerns for infection" and his condition is listed as serious, Politico reports. Scalise spent nine days in intensive care after being shot in the hip during the June 14 incident. He required several surgeries after the bullet fractured bones, injured internal organs, and caused severe bleeding. Someone got shot by a unstable human. Notice how I didn't blame the NRA? The NRA are not to blame. The few mega rich, old guys that support their rhetoric are responsible for the current death in America. Siding with their Satanic majesties often has repercussions. But someone will always be eager to take his place.